MILESTONE Deutsch The ON THE COMPANY’S 30TH ANNIVERSARY, BILL DEUTSCH HASN’T LOST HIS TOUCH story and photos by Fred Minnick H ey, Yankee, you ever seen anything like this?” a Southern man asks as his thick axe tears apart an Alabama moonshine still. That Yankee was Bill Deutsch, founder of the country’s sixth largest wine company, W. J. Deutsch & Sons, a U.S. wine and spirits importer. Back in the early 1960s, the South was no place for a Yankee to be selling wine. But Deutsch knew the territory after a short stint in the Army and quickly made friends. 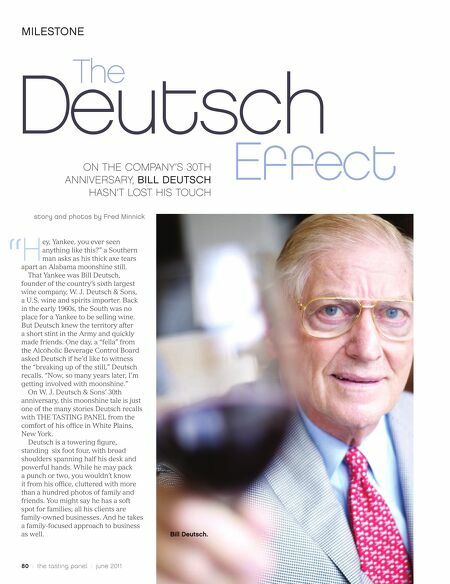 One day, a “fella” from the Alcoholic Beverage Control Board asked Deutsch if he’d like to witness the “breaking up of the still,” Deutsch recalls. 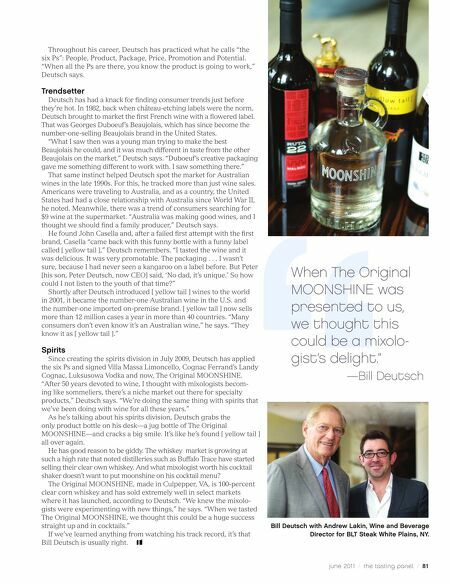 “Now, so many years later, I’m getting involved with moonshine.” On W. J. Deutsch & Sons’ 30th anniversary, this moonshine tale is just one of the many stories Deutsch recalls with THE TASTING PANEL from the comfort of his office in White Plains, New York. Deutsch is a towering figure, standing six foot four, with broad shoulders spanning half his desk and powerful hands. While he may pack a punch or two, you wouldn’t know it from his office, cluttered with more than a hundred photos of family and friends. You might say he has a soft spot for families; all his clients are family-owned businesses. And he takes a family-focused approach to business as well. 80 / the tasting panel / june 201 1 Effect Bill Deutsch.